â€œBringing the heaven on the earthâ€ is accurate for Singapore Supertree Grove. 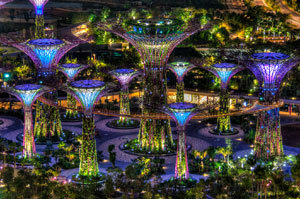 The Gardens by the Bay is a natural park sprawling over 250 acres of land. The amazing three water gardens located in the place are Bay Central Garden, Bay South Garden, and Bay East Garden. The brilliant techno-garden contains Supertree Grove â€“ a collection of gigantic cyborg trees and the Cloud forest along with the worldâ€™s tallest indoor waterfall. 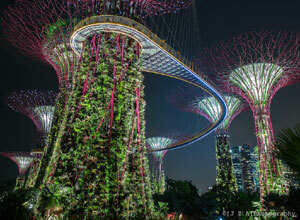 Where is Supertree Grove located? Supertree Grove is located in the Gardens by the bay. The National Parks Board of Singapore started the project to transform the Glory Garden city to the City with a slacked-jaw Garden. There are 12 enhanced trees which contain actual living plants through a steel base. The Supertree grove has Giant super trees and each Supertree grove height falls between 25-50 meters. To make the visitors for visiting at any time, the Super Trees have wide shades with bright lighting and soothing sound systems. 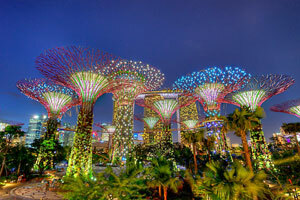 The Supertree grove is being the home for 1,60,000 plants including 200 varieties of ferns, orchids, bromeliads, and tropical flowering climbers. The unique trees are around the gardens where Twelve at the Supertree Grove and six at the Golden and Silver Gardens. The 128 meter OCBC skyway connects two super trees with the Supertree Grove. The Top Bistro at 50 meters high at the Supertree covers the Garden view as well as the surrounding Marina Bay. Trunk â€“ A steel frame is there to support the concrete core. Planting panels â€“ Installed on the trunk for the planting of the living skin. A short walk from the Super trees, there are a pair of climate controlling bio-domes. The Cloud Forest is a man made dome that spoofs the cool and moist conditions on top of the tropical mountains. A refreshing cool air gust welcomes the Singapore Supertree grove tourists, followed by the tallest indoor waterfall that rains water down from 115 ft above the floor level. Cloud Forest Tickets are SG$28 (US$22.40) including flower dome access. Do not miss out this heck Supertree groove picnic experience. Every day evening there is a mesmerizing light and music program, and the Bay light show, Garden Rhapsody conducts it. Every evening Garden Rhapsody comes twice and Supertree grove light show times are the first show takes place at 7.45 pm and the second is at 8.45 pm. There is No TICKETS for the Supertree grove light show and the Tourists can enjoy the light show at free of cost. There are three places from where the people can watch the Bay light show. From the fringes of Supertree grove, under the Super trees, this makes the people in the midst of the music and light. The Gardens by the Bay Light show lasts for 15 minutes. Supertree grove admission fee is split under different categories. There is no admission fee levied for outdoor gardens. There are Garden cruiser services available such as Shuttle Service, Outdoor Garden Audio Tour and Auto Rider. Tourists can enjoy sumptuous delicacies with cocktails, wine, beer and beverage. Whether it is Alfresco rooftop bar or dining in the chilling air-conditioned lounge, it is definitely a bind-blowing experience by munching the steaks and viewing Singaporeâ€™s cityscape. The Grant Associates with a team of Engineers Atelier One (structures) and Atelier Ten (environment) hold the pride of designing such a mind blowing and eye catching Supertree Grove. The Garden by the Bay was inaugurated in 2012 and the same year it won the World Building of the Year award at World Architecture Festival. Besides, The Cloud Forest and the Flower Dome bagged the Best display building award. Among the three gardens, Bay South Garden is the largest garden which occupied 5, 40,000 Sq.m. All the 18 Supertrees are in the South Bay. All the 11 Supertrees are with environmental implantation and sustainable functions. Some have photovalvic cells to illuminate the trees at night time. The other trees are with the Cooling Conservatories, serve as air exhaust container. During the garden of construction, around $7 million dollar was set up to study the most effective methods for blooming the foreign flowers. The 6 glass houses are there to stimulate the apt climatic condition for the natural plants and flowers growth. The Gardens by the Bay received 20 million visitors in the year 2015. Tourist rush to Singapore Supertree grove all over the year. 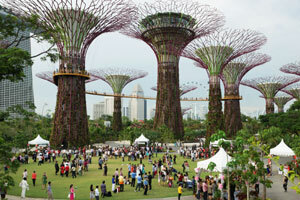 However, the best time to visit the Gardens by the Bay is between 4-5 pm. There is always a huge crowd at 7.45, 8.45 PM, i.e. in the â€œGarden Rhapsody showâ€. This is the peak hour in the place. Many of the tourists plan their itinerary as visiting the Flower Dome, the Cloud Forest before the sunset, during the sunset going for a skywalk, loitering around the Outdoor gardens and finally waiting to watch the light & music show. Where to board in Supertree grove? It is time for you not only to enjoy the Singapore Supertree Grove Picnic, but also to rest and eat yummy delicacies. You may find out various kinds of Restaurants, Hotels, and Luxury Star Hotels for your accommodation. Besides, satiating taste buds, you may relax in the pleasant atmosphere with Singapore Spas, Singapore massage, rejuvenating therapies. While planning your Supertree grove Itinerary, book your accommodation to avoid the final hour rush.